Rotor Clip Engineers can work with customers to produce a special retaining ring to accommodate their unique applications. Here is an example. The groove is machined with a corresponding 15° bevel on the load- bearing groove wall. When a beveled ring is installed in the groove, it acts as a wedge between the outer groove wall and the part being retained. 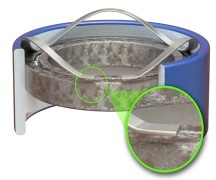 The rings spring action causes the fastener to seat more deeply in the groove and compensate for the endplay. However this customer had a unique problem: the beveled ring had to fit over a larger diameter shaft than the ring could accommodate. The ring would be stretched beyond its elastic limit when installed and take a permanent set, which meant the ring would not return to its original size and grip the groove properly. This would have certainly led to the failure of the application. 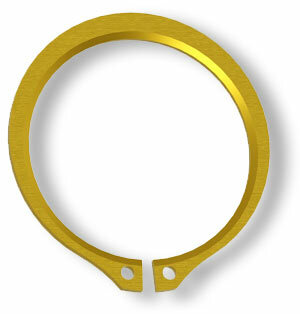 Rotor Clip engineers deigned a special beveled ring (Figure 2). This design allowed the ring to be installed over the larger shaft without taking a permanent set, ensuring its proper functioning in the application.